Packaging: 8-panel digipak in clear plastic cardboard slipcase includes one-sided paper insert with tracklisting. ℗ 2005 Polydor Records Ltd. © 2005 Polydor Records Ltd.
except CD2, tracks 2-2 to 2-5 ℗ 1987 BBC Music & Tracks 2-6 to 2-9 ℗ 1989 BBC Music. Released by arrangement with BBC Music. Recorded for BBC Radio 1's John Peel Show. 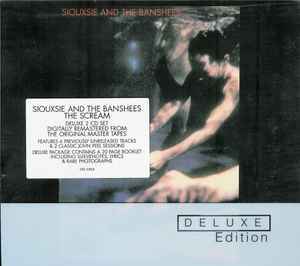 Tracks 2-1 & 2-10 to 2-14 ℗ Siouxsie And The Banshees. Licensed courtesy of Siouxsie And The Banshees. The copyright in this sound recording is owned by Polydor Records Ltd, a Universal Music company. Made in the EU. CD1: 983 238-9. CD2: 983 239-0 (Set number: 983 238-8). Mixed at De Lane Lea, August 1978. CD1: All songs published by Dreamhouse / Chrysalis except track 1-4 Dreamhouse / Chrysalis / Sparta Florida Music Group Ltd., track 1-5 Northern Songs Ltd.
CD2: all songs published by Dreamhouse / Chrysalis except tracks 2-1, 2-2 & 2-8 Dreamhouse / Chrysalis / Sparta Florida Music Group Ltd., track 2-9 Northern Songs Ltd.
Digitally remastered at Universal Digital Mastering, London. Tapes sourced by Zoe Roberts (Universal Tape Facility) & Steven Severin. Re-issue designed at Bold, London. Durations are not given on the release.